I love to read, and I love to read books that make learning fun; The Information is one of those books. For this invention [writing] will produce forgetfulness in the minds of those who learn to use it. … You have invented an elixir not of memory, but of reminding; and you offer your pupils the appearance of wisdom, not true wisdom. Imagine if Plato saw how many of us use more modern technology — an always-available Internet search engine, for example — so that we don’t even have to think twice about getting access to entire libraries of “the appearance of wisdom”. It goes on from there to explain how people in Africa developed long-distance communication with their “talking drums” long before Europeans had strung up the first telegraph. He uses the telegraph to lead into a discussion of cryptography, information theory, and data compression. Sometimes mathematical truth is completely random and has no structure or pattern that we will ever be able to understand. It is not the case that simple clear questions have simple clear answers, not even in the world of pure ideas, and much less so in the messy real world of everyday life. 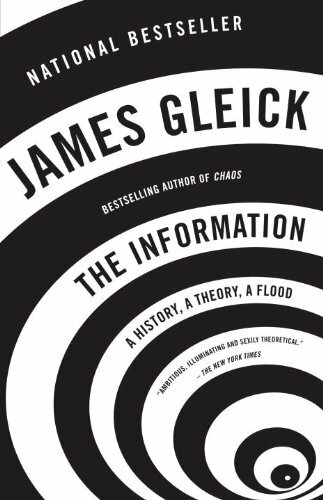 Of course, any recent book about how we think about what we know and how we collect and classify what we know wouldn’t be complete without some discussion of Wikipedia. And, here, there was a hidden gem for me. I discovered that I know one of the characters in a story he tells about the growth of an article about a butcher shop in South Africa. Jimbo Wales, co-founder of Wikipedia, created a stub article about a butcher shop he visited and a few hours later, ^demon, a developer I’ve worked with at Wikimedia and grown to respect for his keen eye for detail proposes deletion. I fairly squealed when I saw ^demon’s handle in the book. But even if you don’t know ^demon or appreciate the finer details of information theory, you’ll likely enjoy the book. I asked my 14 year old son to read a bit and he quickly tore through the first few chapters before agreeing that it was well-written, fairly entertaining, and accessible. Sounds fascinating. I love the comparison to Plato’s quote about written language. It is intriguing to know it was seen revolutionary. The more we change, the more we remain the same, suspicious of anything new and vociferously stating why.